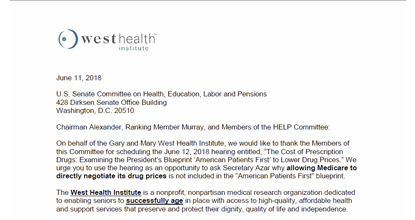 On behalf of the Gary and Mary West Health Institute, we would like to thank the Members of this Committee for scheduling the June 12, 2018 hearing entitled, “The Cost of Prescription Drugs: Examining the President’s Blueprint ‘American Patients First’ to Lower Drug Prices.” We urge you to use the hearing as an opportunity to ask Secretary Azar why allowing Medicare to directly negotiate its drug prices is not included in the “American Patients First” blueprint. The West Health Institute is a nonprofit, nonpartisan medical research organization dedicated to enabling seniors to successfully age in place with access to high-quality, affordable health and support services that preserve and protect their dignity, quality of life and independence. As advocates for vulnerable seniors, we have been outraged by the rising prices of medicines. While Medicare Part D provides needed prescription drug coverage for millions of beneficiaries, the out-of-pocket costs driven by ever-rising prices of drugs can put medications out of reach for older Americans. Allowing Medicare to negotiate its own prices would lead to meaningful reform of this broken system. Although the President supported this policy on the campaign trail, it was not included in the “American Patients First” blueprint published in May 2018. As the single largest payer for healthcare in the United States, Medicare is the gateway to a vast marketplace including 42 million seniors and people with disabilities who are covered under Part D — and also happen to be the highest-volume consumers of pharmaceuticals. Instead, the blueprint included proposals intended to “better negotiate.” However, these proposals do not address the role of Medicare better negotiating drug prices and may increase costs for Medicare and its beneficiaries. For example, the proposal to shift drugs covered under Part B into the Part D program for Part D Plans and drug manufacturers to negotiate has been reviewed and would increase patient costs, according to previous reports from the U.S. Department of Health and Human Services. As such, we do not believe this is a viable solution for lowering drug costs. Again, we urge you to ask Secretary Azar why allowing Medicare to negotiate directly is not included in the blueprint and would like to thank the Members of this Committee who have supported this policy.